Vote now—and vote daily—to choose your favorite among the banquette seating projects competing to win this month's Bob Vila Thumbs Up competition! Whether you decide to remodel a master suite or redo a hallway half bathroom, there are a few universal concerns. For instance, the fixtures and decor elements you choose should fit your style, budget, and allow for ample storage in a small space. Some incredible bloggers have mastered this balance—and created amazing DIY vanities in the process. 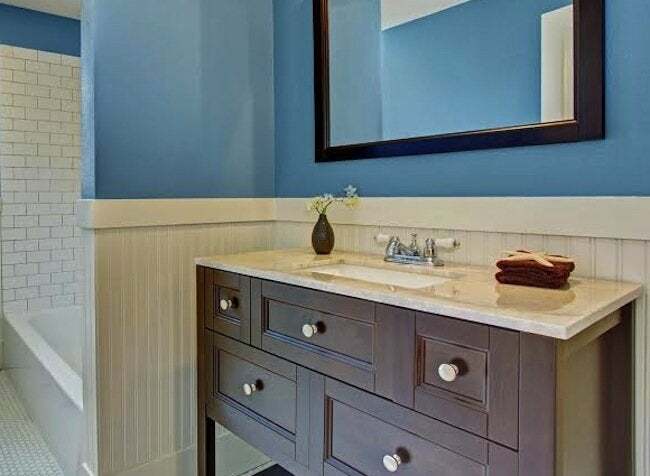 That’s why this month we’re featuring some of our favorite bathroom vanities from around the web in the Bob Vila Thumbs Up competition. Bob Vila Thumbs Up highlights some of the very best DIY bloggers, and this month our theme is DIY bathroom vanities. Whether crafted from repurposed materials or custom building plans, each vanity is functional, stylish, and totally unique. They are all works of art in their own right but only one can voted this month’s champion and the winner of the prize—a $250 gift card. So cast your vote today and every day in November to help your favorite blogger become this month’s Bob Vila Thumbs Up winner. After all, it’s up to your vote to determine the outcome of this competition. Congrats to last month’s winning blogger, Crane Concept. Read more about the winning Bob Vila Thumbs Up project right here. Would you like to recommend a blogger for the next Bob Vila Thumbs Up? Tell us about it on Facebook or Twitter!